Sheep were raised at the missions for their useful wool. Learn more about what type of sheep were at the missions and the products made from their fleece. 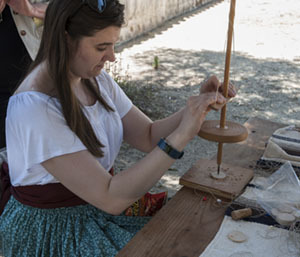 Participants will card and spin wool, then incorporate that piece into a weaving. Sessions last 40 minutes and are held in the Mission courtyard. This activity is geared for ages 8 and up and is free with paid admission to the park.